Straw hats are great for the summer. Leather Bound Online carries straw cowboy hats and Henschel straw western styles. Looking for more? See cowboy leather hats. If you are looking for a large selection of straw western hats you have come to the right place! At LeatherBound we only provide our customers with quality made straw cowboy hats in a variety of colors and assorted hat bands. 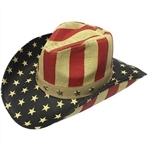 Browse our selection which includes popular western styles from Henschel Hat Company and Harley-Davidson.